Children's Farming & Homesteading Books Are Listed At The Bottom Of This Page. Implements are treated chronologically within a seasonal framework. 32 pgs. Offers practical, hands-on instructions designed to help readers master country living skills quickly and easily. Basic techniques, tools used, sharpening techniques, scythes, sickles, saws. A handbook of woodcraft wisdom.For the camper, vacationer, hunter, fisherman, hiker or anyone who might like to live next to nature. 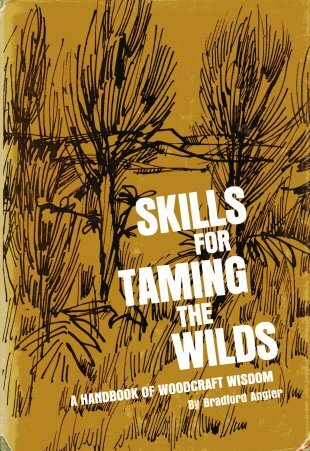 It tells about: enjoying the wilds near your doorstep; dressing for woodland comfort; learning nature's weather forcasting service; the lowdown on backpacking; energy-saving ways of travel; developing a sense of direction; skills with woodsman's tools; rope & knots for every purpose; the knack of managing pack animals; canoe handing; making shelter with what's at hand; stocking a pantry; buidligna home in the woods; eating well; making furniture; corenering game; and much more. Profusely illustrated. 281 pgs. A Do-It-Yourself book of 22 projects in wood for the smallholder: sheep hay rack, 10' wooden gate, brooder, hen dust bath, free standing nest box, goat milking bench, goat house, milking stool, and more. 74 pgs. A grass-based approach for health, sustainability, and profit. This book will help you: determine what you want from your farm, choose suitable livestock, understand housing, fencing, and feeding needs of livestock, reproducing livestock, create a financial and biological farm plan, and make good decisions for you and your animals and land. B/W illustrations, charts & graphs. 217 pgs. Whether it's making ice cream or sharpening an ax, cleaning a chimney or growing raspberries, you'll learn how to do it in this treasury of time-honored country wisdom. Illustrated step-by-step instructions will show you how to milk a cow, tap a maple tree, clean a fish, lead a horse, how to de-skunk a dog, rewire an old house, stack a cord of wood, grow fruits & vegetables, how to build the best chicken coop, and much much more. Loaded with hundreds of illustrations. 564 pgs. The best ideas, concepts, and designs written by readers of Successful Farming Magazine. Such as: grain handling & storage; home & garden; livestock, fencing & gates; shop & tools. B/W illustrations, Color photos. 86 pgs. This inspiring handbook contains everything small-farm owners need to know, from buying land to organic growing methods and selling cash crops: soils, plants, farm machinery, cash & specialty crops, farm practices, etc. 144 pgs. 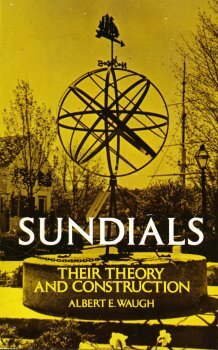 On one hand the author presents a rigorous appraisal of the science of sundials, including mathmaticaltreatment & explanation of the pertinent astronomical background; on the other hand he presents simple and non-technical treatments of dials that can be built by children. Covers all common types of sundials & includes analmmatic dials, polar dials, equatorial dials, portable dials, memorial dials, armillary spheres, reflected dials, cross dials & old-fashioned moon marks. Directions are given for designing dials for any part of the country or any place in the world. Tons of information! Over 100 illustrations, B/W photos, charts & tables. 228 pgs. The most complete, all-in-one volume on every aspect of outdoor adventure and survival ever, from orienteering to campfire cooking to ice climbing and beyond. 7,845 Useful skills & step-by-step instructions. 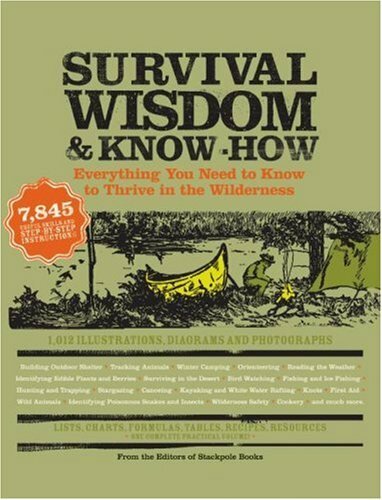 Culled from dozens of respected books from Stackpole, the industry's leader in outdoor adventure, this massive collection of wilderness know-how leaves absolutely nothing to chance when it comes to surviving and thriving in the wildernessand appreciating every minute of it. Topics include Building Outdoor Shelter, Tracking Animals, Winter Camping, Tying Knots, Orienteering, Reading the Weather, Identifying Edible Plants and Berries, Surviving in the Desert, Bird Watching, Fishing and Ice Fishing, Hunting and Trapping, Canoeing, Kayaking, and White Water Rafting, First Aid, Wild Animals, Cookery, and much more. 1,012 illustrations, diagrams & B/W photographs. 480 pgs. Covers the full spectrum of recycling in homes, offices and industry - from technical detail to practical tips. Also discusses the fundamentals of recycling, considering all kinds of recyclable materials, both common (paper, glass, plastci) and uncommon (tires, asphalt, bumpers). 249 pgs. If you have only dreamed about the beauty of building with timbers, this book will open your eyes. It will convince you that this method is not only practical today for homes and other buildings, but often is less expensive than "stick building." Timber frame builder Jack Sobon and writer Roger Schroeder offer a book for builders as well as those wishing to have the work done for them. Here is practical how-to for both beginners and experienced carpenters who want to try this method. 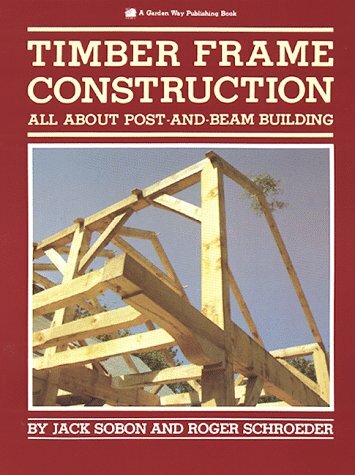 It offers: The basics of timber framing. How to design for strength and beauty. How to combine modern tools and time-tested methods. A starter project: How to build a 12 x 16 garden toolshed. Dozens of illustrations and photos that make it all easy to understand. Filled with photos & illustrations. 204 pgs. Toy Farm Tractors Bill Vossler & Andy Kraushaar Farm tractors in miniature! This one-of-a-kind book details all major makers of toy farm tractors and their famous models, including the celebrated tin-toy maker Louis Marx & Co.; the classic cast-iron toy makers Hubley, Vindex, and Arcade; and the modern makers of high-tech, high-quality toys, suchas The Ertl Co., Scale Models, Carter Tru-Scale, and others. Includes toy steam engines, threshers, implements, farm trucks and horse-drawn machinery. Additional chapters highlight scratch-builders, restoration of toys, pedal toys and salesman samples. 160 pgs. Fascinating story of the development of the tractor, particularly in England. 32 pgs. A guide to understanding, predicting, and working with the weather. Meteorological principles and phenomena explained in a way that's immediately clear and relevant to everyday experience. 244 pgs. How to build your own log, frame, or adobe cabin & where to build it. Guidance on: location, tools, lighting, heating, fireplaces, water supply, sewage disposal, foundations, floors, chimneys, porches, eaves, ceilings, interior design, furniture, and the art of cabin living. B/W photos & illustrations. 194 pgs. A variety of rich materials for all land-owners about domestic animals and domestic economy, farm buildings, gardens, orchards, vineyards and all farm crops, tools, fences, fertilization, draining and irrigation with an appendix on the diseases and cures of domestic animals. Lots of drawings & illustrations. 257 pgs. Written by the first man to succeed in shearing 456 sheep in a day, it is a clear exposition of the procedures, not only of fast shearing, but of close, clean and good shearing. Chapters: types of sheep, quality of work, style, blades v machines, shearer's diet and clothing, dealing with difficult sheep, crutching, gear, grinders, sharpening cutters and combs, care & repair of shearing machines, competitions, design & planning of woolsheds, design of sheepyards, sheep breeds and their shearing qualities, and shearing terms. Illustrated with an exceptional set of 57 photos & 20 diagrams. 161 pgs. How to set up and maintain a worm composting system. You will learn how to recycle kitchen food waste, save energy, produce fertilizer for house and garden plants, grow fishing worms, and reduce waste disposal costs. Illustrations. 162 pgs. An entrepreneur's guide to starting and succeeding in a farming enterprise, this is the book is for anyone who has ever dreamed of being a farmer. Practical and optimistic, You Can Farm gives prospective farmers a clear, step-by-step approach to turn their vision of a farm into a marketable reality. Illuminating both the pitfalls and the promise of farming, Salatin shows how you can make a living, and even a profit, by working the land. This readable guide is packed with advice that takes into account the whole farm, from getting along with neighbors to deep bedding livestock. Covers areas such as: examining your ideas, acquiring land, where to settle, what you need, self-employment, water, livestock sanitation, soil fertility, reducing costs, establishing your market, and much more. B/W photos. 480 pgs. Press-out model of a farm depicted in several Usborne children's books. Ages 4-8. Several different colorful scenes on the farm with descriptions. Ages 2-5.